Convertible cribs are obviously a great investment. For as little as $100 more than a traditional crib, you can buy a convertible crib that will see your precious munchkin right through to college. The decision to buy one seems like a bit of a no-brainer at first glance. I mean why spend money on a crib, a toddler bed and a full-size bed when you can get all three for the price of one? Designed for your adventurous, but still clumsy toddler. The baby crib is converted to a toddler bed by removing one of the sides and replacing it with a toddler conversion rail. Designed for your equally adventurous, but slightly more adept preschooler. The toddler bed is converted to a day bed by removing the toddler conversion rail whenever you are brave enough! My seven year old still slips out of bed occasionally! Plenty of pillows on the floor at bedtime are always a good idea! Designed for your older child, moving towards the age of independence. I know - you don't even want to think about it - neither do I. They grow up way too fast! An additional full bed rail kit is usually required for conversion to a full-size bed. The baby crib that converts to a toddler bed and day bed. Generally, if a crib is described as convertible or 2-in-1 convertible, this is what is being referred to. The baby crib that converts to a toddler bed and day bed and later a full-size double bed. Generally, if a crib is described as 3-in-1 convertible, 4-in-1 convertible, lifetime or built to grow, this is what is being referred to. Drop-down rails on one side of the crib - Allowing easy access, you can even change or dress your baby in the crib. Remember to look for a one-hand release mechanism. Note that many convertible baby cribs do not have a drop-side as this results in a less stable baby crib. Teething rails - To prevent baby from getting a mouth full of splinters when those first precious teeth start pushing through. Some babies become VERY attached to their baby cribs. Moving them to a toddler bed, when they learn to climb, can be somewhat stressful to say the least. Your previously peaceful baby, who used to sleep blissfully through the night, is suddenly waking at all hours. Nighttime chores such as water fetching, blanket tucking, light switching (on and off) become the rule of... well, the night! One piece of advice: Don't change the bedding at all when you convert the crib - little things like this upset delicate little people! The bedding can be changed a few days later when baby is used to his fun new bed. Baby thinks up anything and everything that will assure your presence with him for a few more minutes. Your poor little one is experiencing separation anxiety - from his crib! With a convertible baby crib, this needn't be the case. Make sure your baby is present and watching while you remove one side of the crib and replace it with the toddler guard rail. Show him how to climb in and out by himself, and hopefully you will enjoy many more nights of sleep filled bliss! There are plenty of organic convertible cribs to choose from. Go to BabyEarth.com's eco furniture section to see what's available. 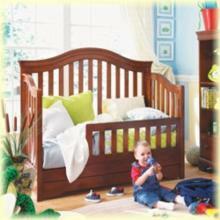 Convertible baby cribs are sized for standard mattresses and bedding. Therefore, there is an organic option here too. Synthetic mattresses have been associated with an increased SIDS risk. It's a good idea to buy all the necessary conversion rails at the same time as the crib. This will save you from running around in a few years time, trying to find items that are no longer available. Are really good value. You can expect to pay around $100 more than for a standard crib of the same brand. In many cases this includes the toddler conversion rails. You will, however, have to pay extra for the full-size bed rails, when you want to convert the day bed into a full-size bed. Most of these cost around $100. In some cases come with optional trundle beds or storage boxes to go under the full-size bed. 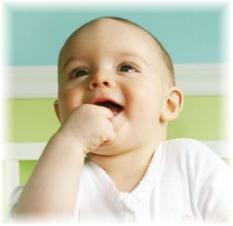 Use standard baby crib mattresses and standard baby crib bedding. Again - these are readily available, in a wide variety, at your local outlet or online, with an organic option. Are available with canopies in a few cases. Use standard nursery bedding, which is available in abundance. Choose almost any nursery theme or color scheme and you will find a number of bedding options to match. Are available in a large variety of finishes, including white, cherry, oak, black and natural. Are included in most of the leading brand product lines. 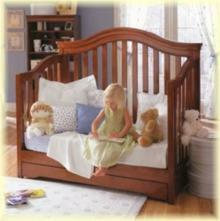 Are often offered with coordinating changing tables, armoires and dressers. Are available in wood or metal. 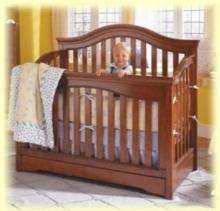 Bratt decor makes two convertible iron cribs: The Casablanca Premiere and the Venetian Four Poster. 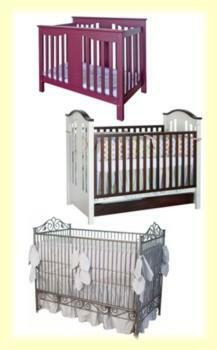 Visit ababy.com for Bratt Decor iron cribs. Unfortunately, whether we like it or not, teenagers have opinions - usually strong ones that are in complete opposition to the opinions of their parents. Come on - you remember - it wasn't that long ago! In a nutshell: How do you know what a teenager will want in her bedroom, while she is still kicking around in your belly making you nauseous? Of course, you could take the approach that your children will do as you tell them while they are under your roof. I completely agree. However, I believe the rambling parental maze of the teenage years is not one to be attacked head on, but rather with contemplation and forethought. If I can avoid the showdown that is likely to result when I tell my teenage daughter what color her bedroom furniture is going to be, I will happily do so. However, that's just me - I guess she could always paint it - bright pink would be my guess! !